The People’s Democratic Party (PDP) is “reckless and desperate,” Information and Aviation Minister Lai Mohammed has said. Lai Mohammed said this in reaction to claims that the federal government and the All Progressives Congress (APC) want to obtain an interim court order to declare the Senate President seat vacant. 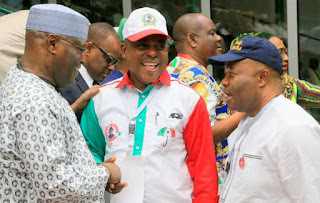 Following the defection of Bukola Saraki from APC to the PDP, the ruling party had called on him to step down as leader of the upper legislative chamber. While reacting to the claims, Mohammed alleged that the PDP has run out of ideas.“Few days back, the PDP claimed that there were plans to invade the senate and sack Saraki,” the minister added. "Today, they said we are planning to use the court to sack Saraki. Nigerians are tired of all these false allegations. "The PDP is reckless and desperate. They are afraid of their own shadows. They are so troubled and have gone out of ideas and make allegations without proofs.